Adam & Andrea Shirey: Where's the time gone? It turns out I haven't made a blog posting in almost a year. Who knew? We've all been keeping busy around the Shirey household, and while it's almost time for my yearly review of what we've done in the previous calendar year, I might as well go into it now. Reed is now a year and a half old and is starting to combine words. Whereas Jacob was obsessed with tractors at that age, Reed loves cows. He's pretty good at "please" and "more" in sign language, and he's got a budding spoken vocabulary. Jake is over three now and has really sprouted a personality. Every so often, we'll catch him reading books or singing to himself. 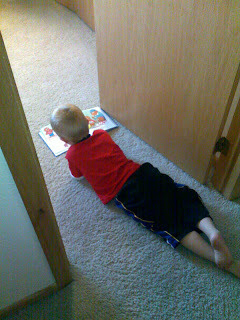 This picture (taken in late October) was him reading quietly to himself in his room during quiet time. He's also become interested in going on "bear hunts" with us in the basement. Andrea has started working again; as of late, she's been getting a number of days at St. Michael Catholic School. The boys are in daycare with Toby only a half mile or so from my work, so I drop them off and pick them up every day. Andrea is also finishing up her time with the Clearwater Fire & Rescue Department. She's been on for ten years and has decided it's time to hang up her helmet. As for me, I've been keeping rather busy all-around. I started taking some psychology classes at SCSU (with this semester wrapping up in a few days). I've had more R&D projects at work lately, the most recent being a Bayesian probability analysis on input data to determine how to pick which input field is more correct. We went to Michigan this July for Jacek & Charlene's wedding, so I got to see them and all my college buddies as well as some of my family. One sad note for this year is that we've given Charlie away. He had become a little grumpy and didn't play nicely with the kids. Rather than constantly keep an eye on him and worry if something would happen, we decided it was best if he go with someone without kids. He was a very good dog with me and Andrea, but he was always on the lookout for the boys who very much liked to play but didn't understand that Charlie wasn't a toy to be jumped on or grabbed. We're glad we didn't have to put him down, but it was still sad to see him go.